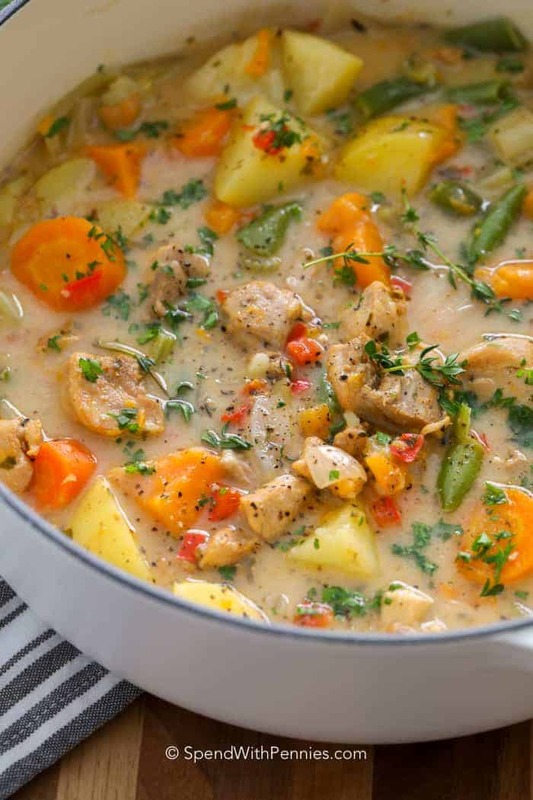 Chicken Stew is a delicious meal with chicken, potatoes and sweet potatoes, onions and carrots. It’s all simmered in a rich seasoned chicken broth until tender. It’s one of our all time favorite meals (along with beef stew)! 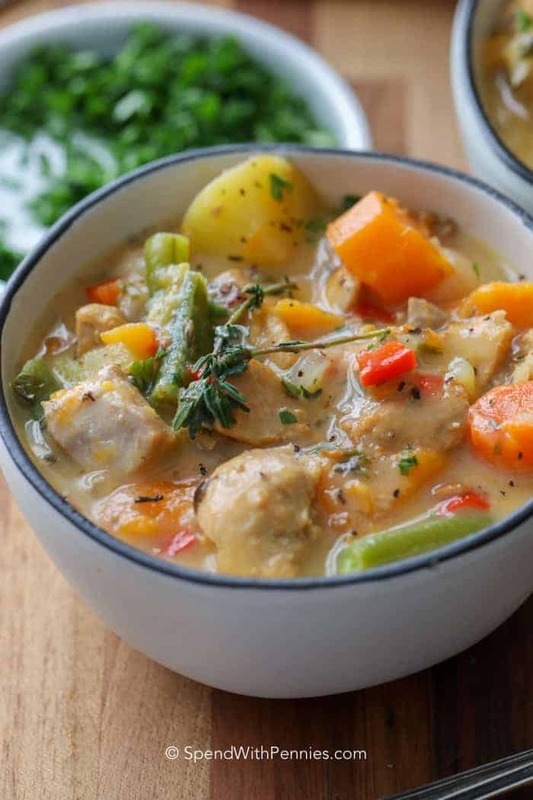 A recipe like this chicken stew is a meal unto itself… full of protein, healthy carbs and veggies. We serve it with a salad or Easy Homemade Buttermilk Biscuits to sop up anything left in the bowl. It’s true chicken soup perfection. 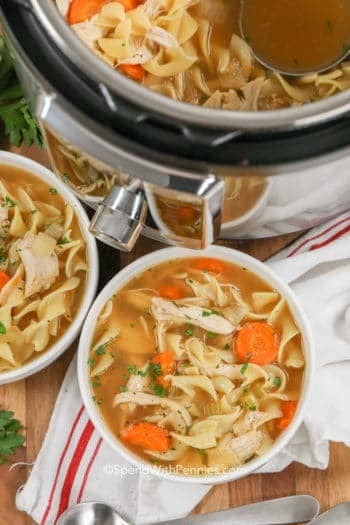 Chicken soups are truly the ultimate comfort food from Crock Pot Chicken Noodle Soup to belly warming Chicken Rice Soup. 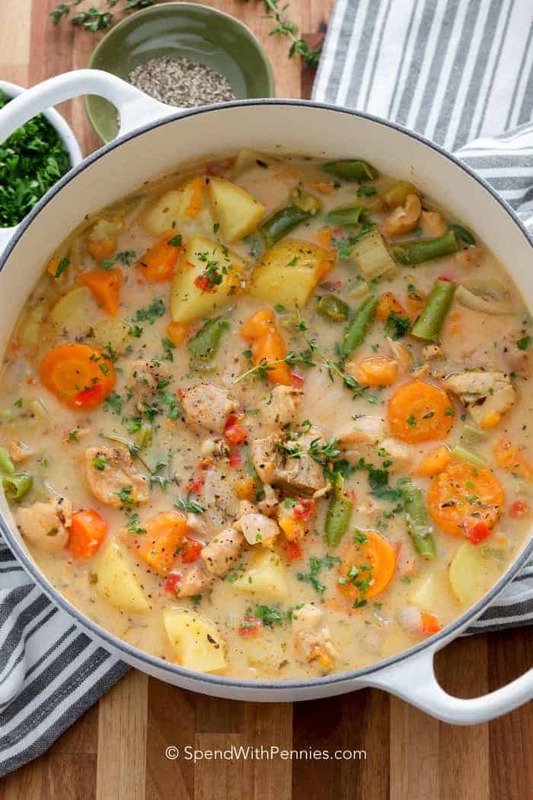 This easy chicken stew fits the bill perfectly. 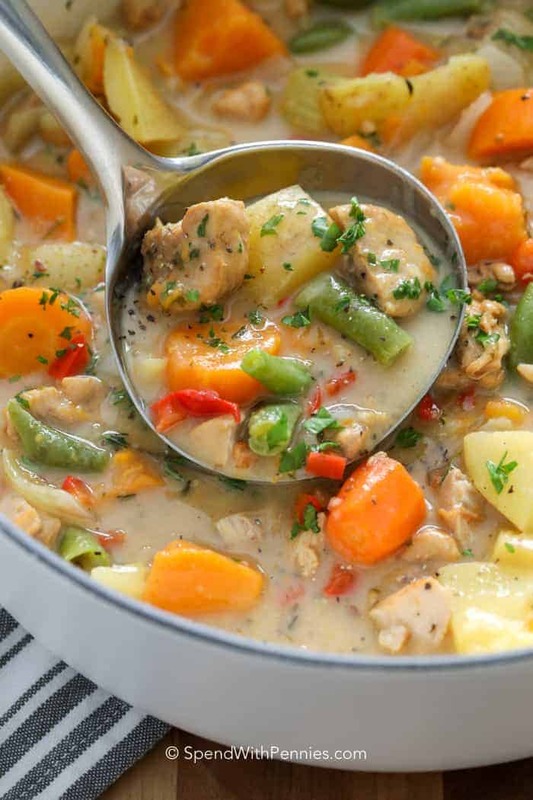 This simple chicken stew recipe is fully loaded with tender chicken and vegetables simmered in a deliciously seasoned broth! 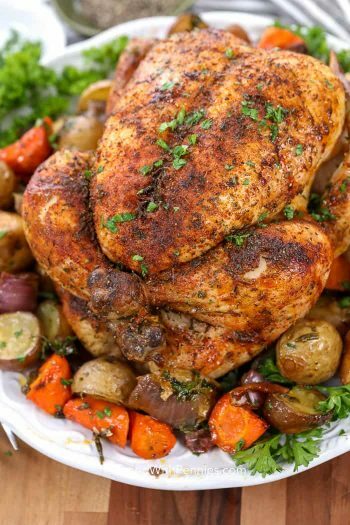 I use thighs because they tend to hold up better to the simmering but breasts can work well in this recipe too! If you’re using chicken breasts, I would suggest browning the chunks and then adding in the last 20 minutes or so. If you have other veggies you love (root vegetables are especially great) add them in! Brown chicken at a high temp. No need to cook it through, you just want the caramelization and flavor. Soften onions/carrots/celery and add flour (to thicken a bit). Add broth, herbs and veggies. Homemade chicken stock or store bought work just fine. Crazy easy right? 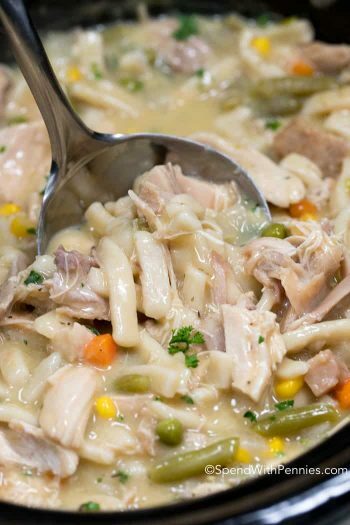 I add a bit of heavy cream at the end to make this chicken stew just a little bit creamy. You can skip the cream if you prefer or add extra if you’d like. 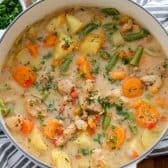 Sweet potatoes are a great addition to this hearty chicken stew recipe and they do soften quite a bit, this helps thicken it. The flour added at the beginning will thicken this chicken stew but you can certainly thicken it more if you’d like! You can use a mixture of either cornstarch or flour with broth or water. I find cornstarch is less likely to be lumpy but flour tends to reheat/freeze better so the choice is yours! You can also add instant potatoes to thicken a little bit at a time. Combine 2 tablespoons flour with 1 cup of water or broth (I prefer broth) and shake very well. Pour the slurry a little at a time into the boiling chicken stew while stirring. Once your stew is thickened, allow it to boil for a couple of minutes. You’ll want to make sure your flour mixture has no lumps before you add it, I use a shaker jar or mason jar and shake really well. Can You Freeze Chicken Stew? 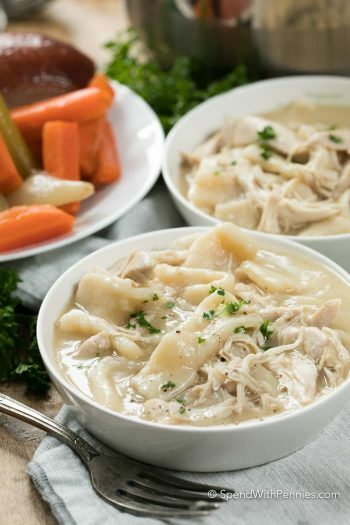 Chicken Stew can be frozen! If you plan on freezing it, I’d suggest using flour as a thickener (not cornstarch) as it will have a better consistency. I personally freeze in individual servings because they defrost faster and I can take out as many as I need to serve. 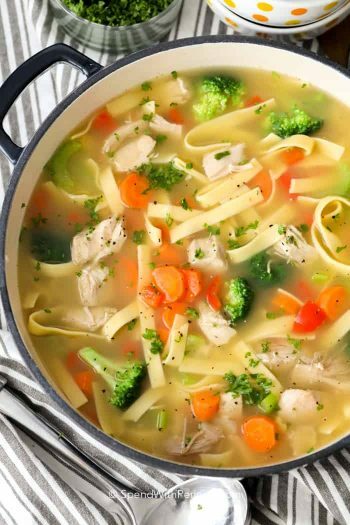 Tender chicken and vegetables in a savory chicken broth. 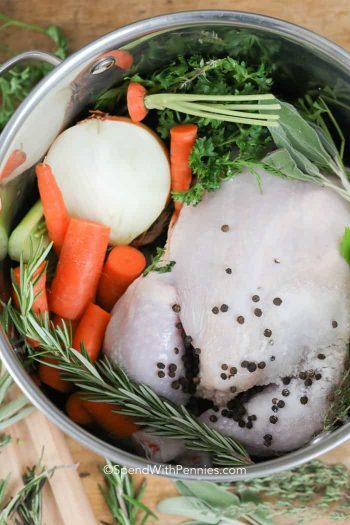 In a large pot or dutch oven, brown chicken in 1 tablespoon olive oil (it doesn't have to be cooked through). Remove from pot and set aside. I decided to make this mid-week since the recipe shows a total time of less than an hour but this took between one and a half and two hours after peeling, chopping, measuring, etc. plus the “cook time” according to the recipe doesn’t account for time to brown chicken or thicken the stew. That aside I found the results to be lacking. I feel the recipe called for too much liquid and could better be identified as a bisque than a stew. It tasted bland so I added some seasoned salt and the result was a marked improvement. Overall I enjoyed the dish and I may make it again but I’ll be prepared for additional prep time, cook time, and seasonings. I am sorry it took you longer than anticipated Chris, but am glad you enjoyed the stew! Made it last night and it was delicious. My chicken gave off so much liquid I didn’t need the other 2 T of oil and I used half and half instead of cream. Definitely will make again. So glad your family loved it Lori. I made this as a soup not a stew, so I cut everything in smaller pieces and didn’t thicken it. It was delicious! The flavors are really fresh. This came together easily, and I had all of the ingredients on-hand. What a great idea Eileen. I can’t get enough soup in the winter so I will have to try this! Yum! Happy to hear you love the stew Kathy! Yum! My family loved this! I didn’t change a thing, except cooking it in my instant pot. Thank you for this! So happy your family loves this stew Rinda! My picky son loved this when I made it last week, and he requested it this week while he has strep throat! Luckily, we all loved it. Just the hearty, healthy thing we need this week. Thank you! Oh no, I hope he’s feeling better soon Anne, I’m glad he loved this stew! This is an excellent chicken stew recipe, I added a bit of crushed garlic . Sounds like a great addition Susan, glad you loved it! Can I freeze this soup? Was delicious! So glad you loved it! You can freeze it, but the potatoes my change in texture when it is reheated. What is the serving size for the nutrition information? It’s approximately 1 1/2 cups, this can vary slightly based on the size of your vegetables. Delicious. This now is our go to chicken stew recipe. So happy to hear you love the stew Phillip! Made this recipe Yesterday. Gotten great reviews, at work. Glad everyone loved it Cindy! Very good recipe, easy, good flavors, comfort food at it’s best! I am so glad you loved it Andi! Those sound like great additions. Enjoy! Yes, I used boneless skinless thighs (for the same reason you mentioned, they don’t dry out). Enjoy!! I was thinking to add canned tomatoes. What do you think about that? I have only made this recipe as written, but if you add them let me know how it turns out! This chicken stew sounds delicious. I have a new instant pot and I would like to adapt it to use that way. It shouldn’t be hard to do. I’ll let you know how it turns out. Made your chicken stew it was a success around here will definitely make it again . I haven’t but I do think it would work just fine! Could you substitute the heavy cream for something lighter? Thanks! You could use light cream or skip the cream altogether if you’d prefer. Just making this today and finding it is ending up quite soupy. Followed recipe and made a note to cut back on the 4 C broth to 3 and save 1 C to make the slurry. Other than that it looks wonderful. I also want to know if wine can be substituted or omitted?? You can leave the wine out and just use broth if you’d prefer! Had everything on hand but the cream and green beans, so I did without, but it came out fantastic! I made it in the instant pot, so easy. Thank you for the recipe! A filling but light meal that is high on nutritional value! So glad you enjoyed it Amanda, I’ll have to try it in the Instant Pot! Is there something I can substitute the wine for? You can leave it out if you prefer. Can something be substituted for the wine? Just add that much more chicken stock. I use a dry wine. I use whatever kind of potatoes I have on hand, most often red skinned or baby potatoes. Frozen green beans (that have been defrosted) work well in this recipe! Do you use fresh herbs or dry. 1/2 teaspoon sounds dry herbs but the picture looks like you use fresh. Please advise. I use dry in the recipe (as it’s what most people have on hand). I garnish with fresh if I happen to have them on hand. So glad you loved it Helen! I was wondering if adding one can of tomatoes would be good with your recipe? I haven’t tried it but do think it would be delicious! This is one of my favorite soup/stew recipes of all time! I love the slight sweetness the sweet potatoes give off. I used ground turkey since I didnt have chicken and it was still great. Can I use frozen vegetables? Did you only use fresh? You can use frozen vegetables, they may cook a little bit quicker so you’ll want to keep an eye on them so they don’t get mushy.